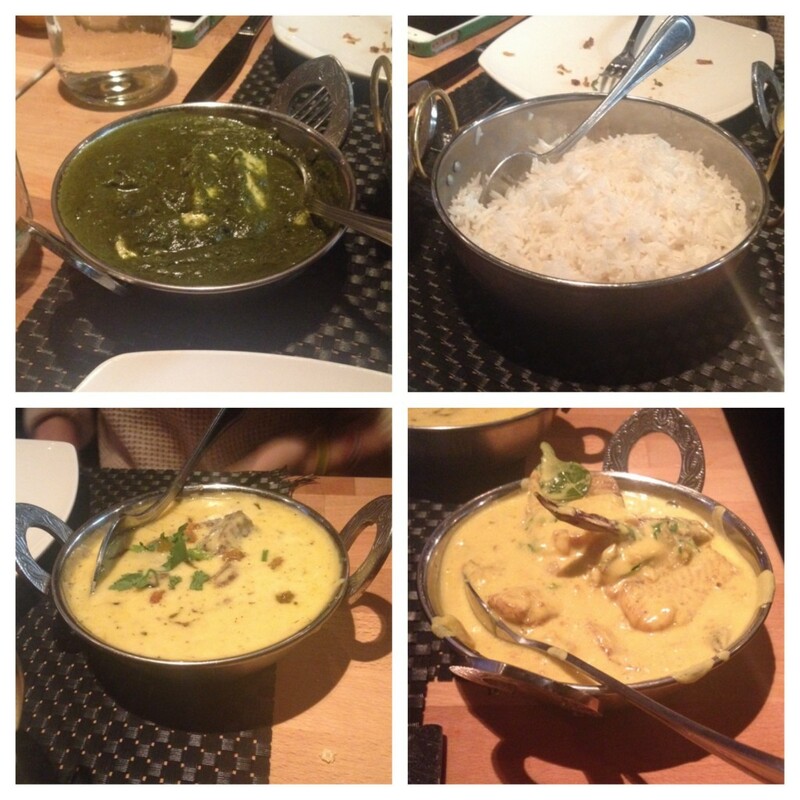 I had been craving some quality Indian cuisine when I discovered Malai Marke in the East Village. Lately, while scrolling through endless Seamless suggestions, the thought of ordering Indian crossed my mind. But, like a great New York slice, finding that perfect Indian place in a sea of mediocrity is hard to come by. Malai Marke was that golden spot—quality food, great atmosphere, affordable prices, and a lovely location, especially in this crisp fall season. 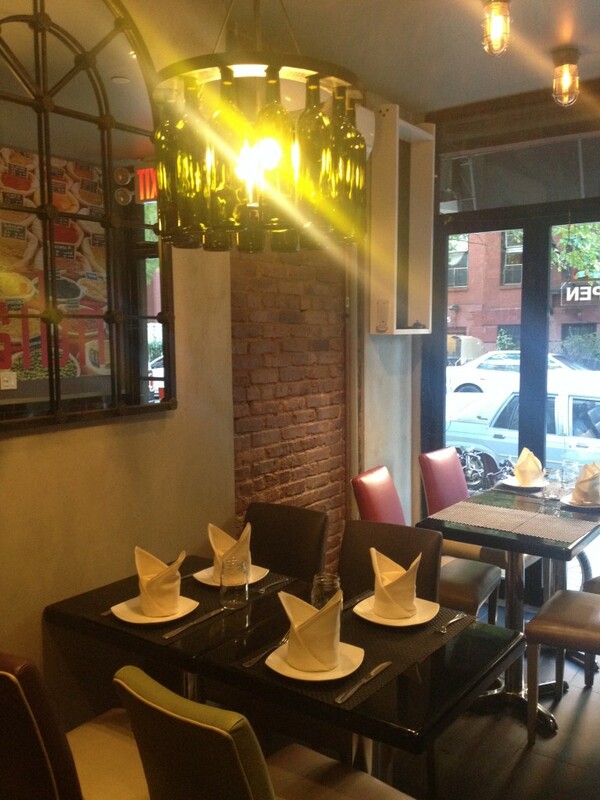 Malai Marke is part of a group of restaurants that strive to provide quality and culture. Whether it’s Chola on 58th St, one of the best Indian buffets in the city, Dhaba in the Flatiron District, rife with traditional flavors and a chic atmosphere, and other various eateries, Malai Marke is a piece of a rather successful enterprise. How are these restaurants so successful? They focus on quality and giving the absolute best food they can possibly give. The managers of these restaurants, like Roshan, the manager of Malai Marke, are confident in what they are doing, both in terms of business and good cooking! So many options on the affordable lunch menu! Malai translates to cream, a slang term used in Northern India. This Northern Indian cuisine focuses more on creamier, smoother flavors and less on spice, differing from that of Southern India. One of the favorite dishes at Malai Marke is the Malai Chicken Tikka Masala, chicken cooked in a creamy tomato sauce, a different and unique take on the common chicken masala. Before jumping into the heavier foods, my friend and I started with fried okra. 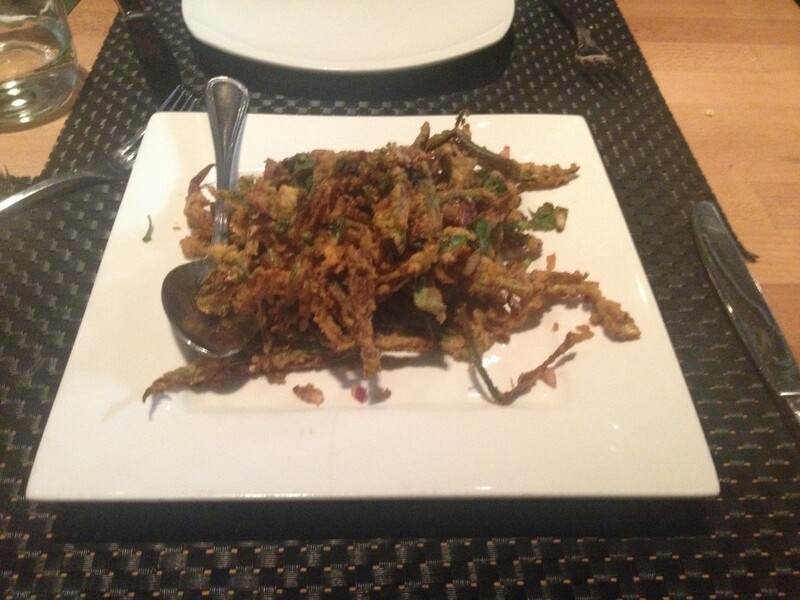 Roshan laughed as he handed us a plate full of golden- brown strands, resembling fried onions. He claims that everyone is too scared to try the okra, so he simply sets it down on their table, offering a complementary appetizer to unsuspecting customers. Without revealing what this crispy, salty, perfect-for-sharing dish is, people are already asking for more, their okra fears a thing of the past. When it came to the metaphorical “meat” of the dish, I was in awe. Determined to have us try a little taste of everything, Roshan brought us quite the selection. Upon ordering Saag Paneer—a spinach curry with paneer cheese—and Lamb Pasanda—lamb in a creamy, nut sauce—Roshan also brought us Fish Moilee, which consists of fish in a creamy coconut curry sauce, lemon rice, spicy chicken, garlic naan, mango lassi, and Gulan Jamu for dessert to finish up. Like I said, we were in awe. Not only did the quantity of the food astound us, but the quality helped us regain our faith in Indian food in the city. Everything was pretty incredible. The flavors weren’t too overwhelming and each bowl of goodness was cooked to perfection. 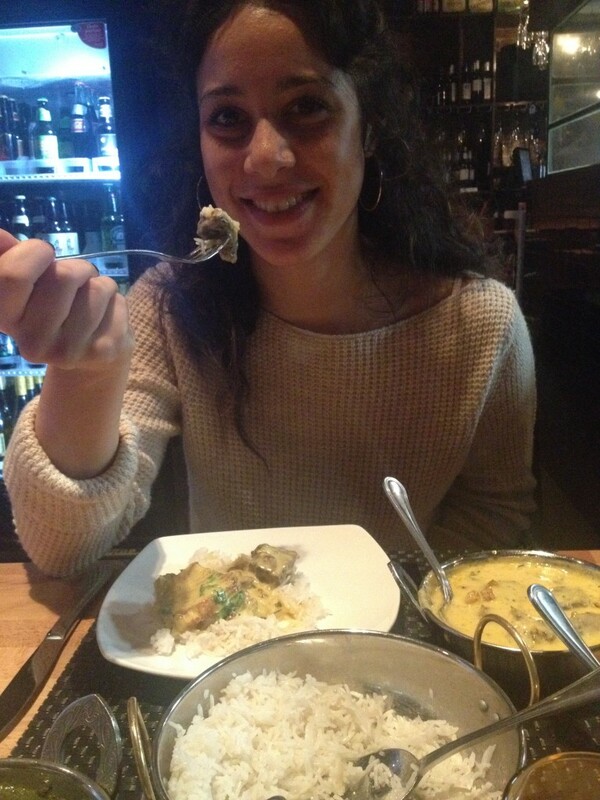 I would personally recommend the fish in a coconut curry sauce; as a pesscatarian, I was in heaven. 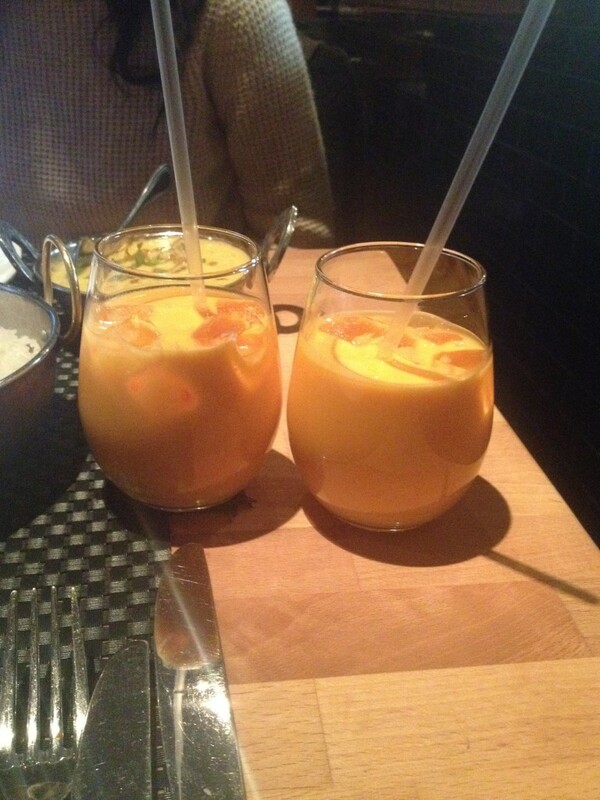 The mango lassi was the perfect addition to the meal. This mango yogurt blend was sweet and the texture was smooth. After so many different spices, the coolness of our sweet and creamy beverage was much appreciated. This lassi was sweet, creamy, and perfect for our meal! 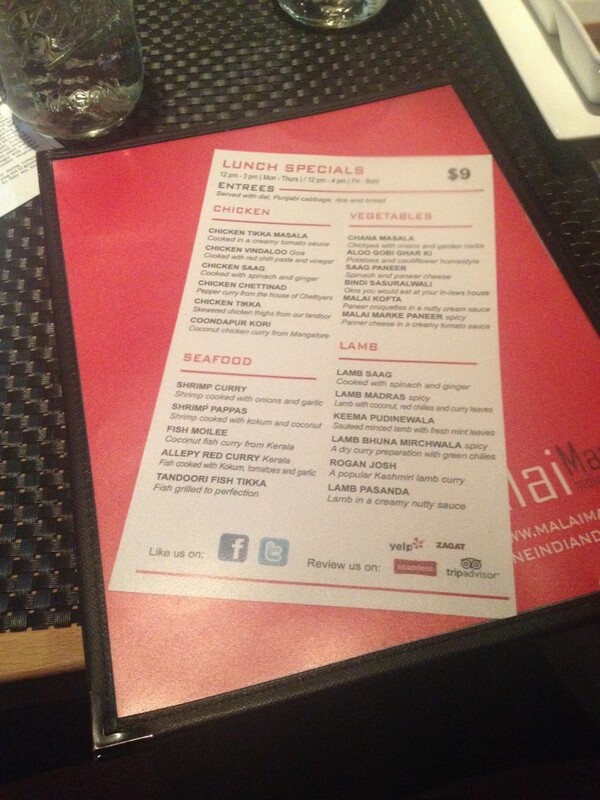 Located on east 6TH Street, not only is Malai Marke near New School dorms, NYU buildings, and Cooper Union, it works well with a student budget—the lunch special is only $9! Malai Marke is promoting culture by providing unique foods and utilizing a huge menu to not only please those unfamiliar to Indian cuisine, but to educate them as well. And just for a heads up—the owner of Malai Marke is always thinking of new concepts for new restaurants, so stand by for some new, great restaurants to try! Malai Marke is great for students! Whitney loves eating here! After we attempted to finish our meals, we caved and opted for a to-go container as well. Nothing is more satisfying than a great Sunday lunch where you leave full and content. Everything at Malai Marke was amazing! Plus, I learned that it stays amazing, even if you have to eat it later that night in your living room out of a to-go container while watching Netflix. That doesn’t actually sound that bad. Did I mention that they deliver? This entry was posted on Thursday, November 7th, 2013 at 6:05 pm and is filed under Cheap Eats, onFood, Restaurant Reviews. You can follow any responses to this entry through the RSS 2.0 feed. You can leave a response, or trackback from your own site.